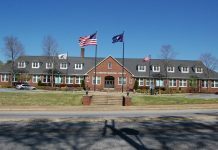 Envision Williamston and the Town of Williamston will host a state meeting of the Main Street South Carolina program this Thursday, April 11. Approximately 30 people from across the state are expected to attend the Second Quarter Training meeting which will be held at the Williamston Municipal Center. The event will spotlight Williamston and include a downtown area Williamston Walking Tour. Several Envision Williamston beautification projects will be included on the tour including recent restoration of the town’s Municipal Center Auditorium; downtown banners and beautification/streetscaping; Ms. B’s Hot Dogs, a new local business featuring an outdoor deck constructed with an EW facade grant, The Journal and future open-air event venue featuring the EW decal project and facade grant; M&D Upholstery – restoration – facade grant; The Davenport House Event – Venue & restoration; “Modern Spring” mural; the Walking Trail & “A New Day on the Trail” mural by Artist Andy Gambrell and possible future redevelopment opportunity for former water treatment plant. Also the Train Depot – future redevelopment opportunity, e.g. indoor farmers’ market, bakery and drinks; the Palmetto Pride Social Rest Stop w/sail shade, greenway & wayfinding sign at Gossett Street; the Armory Fitness Center, a new thriving business; Veterans Park and walk-through of Mineral Spring Park featuring the Spring Gazebo & Amphitheater event venue and historical site; the Confederate Skirmish marker and visit of Yesterday’s Ride; visit Goody’s Department Store and view “The Dream” mural – existing business enhancement; point out Ace Hardware and McDonald’s recent reinvestments totaling $500,000 – $1,200,000. The meeting will begin at 10 a.m. Envision Williamston Board Chair Roxanne Hall will welcome the visitors which will be followed by a spotlight of the local Main Street Program (Envision Williamston) and the walking tour. Other discussion will include: Brownfields Redevelopment by Becky Horace, Grants Coordinator, Terracon Tice Welborn, Senior Geologist, Teracon; Understanding Your Local Market by Adam Chandler, Retail Analyst, RED City Planning; Incentivizing Business Mixes by Mary Haley Thompson, Project Manager Economic Development, City of Anderson and State Accreditation Standards and Program Updates by Jenny Boulware, Main Street South Carolina Manager, Municipal Association of SC. 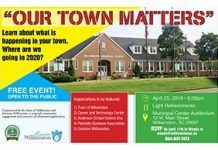 Envision Williamston and the Town of Williamston have other upcoming events including an event called “Our Town Matters” which will be held at 6:30 p.m. April 25 in the Municipal Center. The public is invited to the event which will “celebrate successes and showcase future initiatives”. There will be speakers from the Town of Williamston, the Career and Technology School, Anderson School District One, Palmetto Business Association and Envision Williamston. Light refreshments will be served. Crandall said the event “will highlight quality of life and education in the community” as well as accomplishments and future plans. A “Volunteer Appreciation Dinner” will be held at 7 p.m. April 18 for volunteers who helped with projects and events last year. The annual HOWDY cleanup day will be held May 11.